Abstract. Concerning lunar periodicity in biology, we summarized all what has been observationally and experimentally found and published in scientific literature till 1996. We summoned up as many as about 600 living species (mostly animals) with identified lunar periodicities, functioning in a more or less endogenous manner. Here we give a short review about the occurrence in the plant kingdom. In Thallophytes 45 species have been described as well as 40 species of Angiosperms. In Prokaryonts no lunar rhythms could be found. Their individual life cycles do not reach the time span of at least comparable parts of a lunar day. Thus as in all Eukaryonts the occurrence of the cell nucleus constitutes specifically endogenous rhythms in plants as well as in the animal kingdom. In Cyanobacteria no lunar periodical rhythms have been found. The life cycle of Procaryonta under adequate conditions is too short in relation to at least only parts of lunar rhythms. If ever such rhythms should be found in the dynamics of their populations, it seems very likely that they can be derived from environmental conditions. Only in the marine Cyanobacteria Synechococcum an endogenous factor of the circadian activity for nitrogen fixation could be found by Chen (1991), but that is a solar, not a lunar periodicity. Earth, Moon and Planets 85–86: 405–409, 2001. Figure 1. 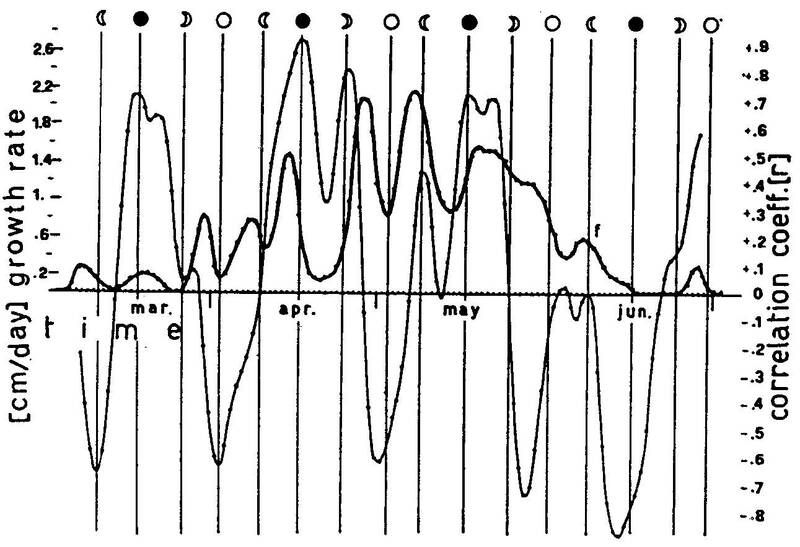 Eukaryontic algae with lunar periodicities (Streble/Krauter, 1978). The Dino flagellate Gonyaulax excavata shows semilunar migration to the surface during springtide every two weeks. Nematodium spec. and Warnowia rubescens of the same order practice it once a month during the third quarter of the synodic lunar rhythm. 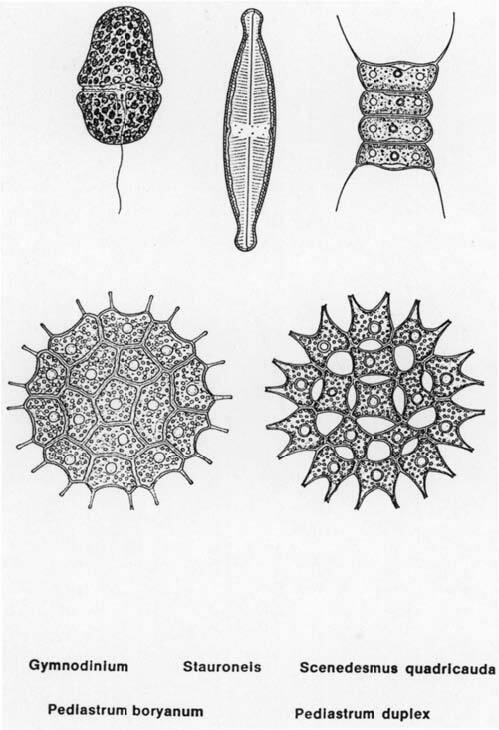 Within multicellular plants about a dozen of species with moon-related perodicities in their reproduction could be found in the brown algae (Phaeophyceae), especially in such common genera as Dictyota, Fucus, Sargasso etc., which produce lundian, semilunar and lunar periods (Figure 2). In green algae (Chlorophyceae) freshwater species of Pediastrum, Scenedesmus and the marine species Enteromorpha, Ulva, Halimeda and Halicystis show similar periodicities in reproduction as well. Figure 2. Periodical variation in the alginic acid content of Fucus virsoides from Barcola/Trieste in an approximately monthly rhythm (Lausi/Cristini, 1967). It is obvious that most of the addressed moon-related Thallophytes live in tidal zones of marine coasts and have obviously adapted to their environment to a more or less strict, genetically fixed amount. The occurrence of moon-related rhythms in higher Spermatophyta, the Angiosperma, mostly being landplants, is therefore of special interest. In 1972 Giovanni Abrami reported his observations here in the Botanical Garden of Padova concerning the growth of several angiosperms during spring time in 1972. The growth, of course, depends on the temperature, being slow at cold weather and quick at warm time. But this correlation was more positive at new moon and more negative at full moon (Figure 3). Thus some investigated plants grow more independently from temperature during full moon. This lunar changes of temperature-related growth he found rather in dicots (5 observed species) than in monocots (2 observed species). Figure 3. Growth rate (thick line) of Campanula ranunculoides and its correlation with temperature (correlation coefficient “r”, thin line) obtained for threshold values 120C and 180C. Botanical Garden of Padova (Abrami 1972). In the vine-plant (Vitis vinifera) a statistical study about the periodicity in eminent plenty of good graves over the historical time from the 15th to the 19th century proved that the best years have been when the flowering phase – the first half of June – coincided with the new moon (Panzram, 1973). The Garden Cress (Lepidium sativum), if treated with ionized air, show enhanced growth during new moon (Graviou, 1978). Brown (1954, 1955, 1979) showed that even small parts of carrots (Daucus carota) and potatoes (Solanum tuberosum)have O2-consumption during winter-time with lundian and lunar periods. The broad bean (Vicia faba) produced maxima in its shoot-growth at the 11th, 14th and 27th day, thus being partly semilunar. The seeds of the garden bean (Phaseolus vulgaris) resorb water with maximum in seven day-distances, related to the new and full moon and the quadratures of the synodic moon. The gas-metabolism of seeds of the tomato (Solanum persicum) and the sunflower (Helianthus annuus) have their maximum not only in the morning hours but additionally during new and full moon, thus being semilunar (Graviou, 1978). In long-day-plants (Agrostemma githago, Iberis amara, Hordeum distichon, Triticum vulgare) the time span till flowering is prolonged to some days under the influence of moon light; whereas in short-day-plants (f.i. Soja hispida) the time span is delayed for some days under the same influence (Gaertner/Braunroth, 1935). In these cases moonlight can be contraproductive to sunlight. After the long discussion over half a century I would like to say that all chronobiological rhythms are always exo-endogenous, sharing their autonomous inner clock to some degree with the periodicity of the environment, both sides being connected by the long process of evolution. It is quite clear: Every organism has its own abilities, at least inherited from its ancestors. And on the other hand it is not a closed system, but part of the system of the environment itself. Thus its constitution is the cooperation of inner and outer systems. Concerning its rhythms there is only the question, if the concerned oscillation is more endogenous than exogenous or vice versa or in balance. But always both sides are involved, if investigated enough. All citations in Endres, P. u. Schad, W.: 1997, Biologie des Mondes. Mondperiodik und Lebensrhythmen, Hirzel-Verlag, Stuttgart/Leipzig; English translation in work by Floris Books, Edinburgh.